Today we’re sharing this basic sugar cookie recipe for you to decorate this Halloween, Thanksgiving, Christmas and for other holidays throughout the year. In a large mixing bowl, beat together softened butter and sugar until mixed. Add egg, milk and vanilla extract and beat to combine. Gradually add in flour mixture while mixing on low. Continue until mixture pulls away from the bowl. Divide the dough in half and refrigerate for at least 1 hour. Preheat oven to 375°F. Sprinkle surface where you will roll out dough with powdered sugar. Remove one half of dough from the refrigerator, and with a powdered sugar-coated rolling pin, roll out dough to about 1/4-inch thick. 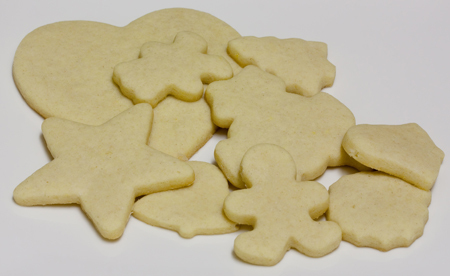 Cut into desired shape and place at least 1-inch apart on a greased baking sheet. Bake for about 8 minutes, or until cookies turn brown at the edges. Remove from oven and let sit for 2 minutes. Move them to a cooling rack and cool completely before frosting or icing. Repeat with other half of dough if desired, or keep for up to one week. This entry was posted on Tuesday, October 24th, 2017 at 1:34 pm	and is filed under Cookies, Desserts, Kid Friendly Fun, Recipes, Tasteful Tuesday. You can follow any responses to this entry through the RSS 2.0 feed. You can leave a response, or trackback from your own site.